Solar Inverters are a crucial component of the overall solar system accounting for around 10% of the overall costs.Solar inverters connect the solar panels to the grid converting the DC to AC which is used by the grid.Solar inverters have become highly sophisticated with features like optimization and monitoring etc.The efficiency of solar inverters are a major factor in their purchase as well as the quality and reliability.Inverters comes in various sizes and can be as large as 1 MW for utility applications.Unlike Solar Panels,the Solar Inverter Market is much less crowded though competition is growing as the size of the market increases rapidly.The ~$2.1 billion market in 2009 with 7 GW of installations has increased by more than 130% to around $5 billion in 2010 as the solar panel demand globally increased to around 17 GW. Note Solar Inverter Companies have done much better as competition is much lower and the annual price declines in solar inverters has been much lower at around 10% compared to the 50% decline in solar panel in the last 2-3 years.Here is a list of the major solar power inverter companies. Market with around 40% of the global marketshare and has become the most valued solar company in Europe as well.The company has managed to keep its margins despite price decreases.The company faces pressures from increasing competition and declining prices. 6) Schieder Electric – This European Electrical Equipment Giant got into the solar inverter market by buying up Canadian Producer Xantrex. 7) General Electric – GE is trying to become an integrated player in the solar PV market supplying everything from products to services.GE is a big producer of wind energy inverters so getting into this allied business is not too tough for this company. Other solar inverter producers are Siemens,Delta Electronics ( bought Solon solar inverter division),ABB and many other small players.The Solar inverter market has also seen a major shift with the entry of micro-inverters by companies like Enphase.The Solar Inverter Market is seeing increasing competition as its large growing size attracts numerous companies.While valuations of many companies have come to single digits,it may not be a good time to buy because of increasing oversupply and competition. “remains to be seen whether it can avoid the fate of Q-Cells.” Really? Meh, SMA will do ok in the long run as Enphase’s new jumpstart IPO will allow them to buyout SMA and save them from oblivion. There are just 2 responses here. Where are the other 2 ?? Schneider-Electric is mispelled in this article. The two factors is very important to consider the efficiency of solar inverter i.e quality and reliability.keep posting such kind of good information. Useful insights. 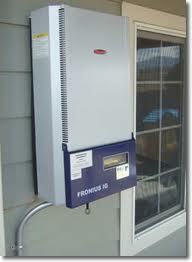 You are right that competition is growing as the size of the solar inverter market is increasing very quickly. The solar panel demand was 17 GW in 2010 and now Global solar analysts NPD Solarbuzz have forecast in their Quarterly Report that global PV demand is likely to reach 49 GW in 2014. So it’s really growing rapidly. We are leading B2B supplier, manufacturer and exporter of hybrid solar inverters from India. Dear sir We want solar inverters for supply in Indian market so advice us which company is best for supply in the Indian market for supply.